Reminds me to appreciate where we are right now, even if we don’t know where we are going to be next month. And to all of you out there who know exactly where you are going to be living next month, rejoice in the clarity. We are living this way by choice at the moment, but there are many, many, many people out there that are not. I cannot imagine the stress of not having a stable home, especially in the winter months. It is my hope that once I have a home, I can make life for those in the community with a home or who are “house-insecure” a little more comfortable and secure. The holidays are upon us. It is inescapable. And quite frankly, I have no interest in escaping. I love this time of year. I love the brisk weather, the music that distinguishes this season from the next, time with family and friends, and the comfort of familiar traditions. I have been making a list of all the ways in which I would like to celebrate this holiday season with my family. Make a gingerbread house, pick out a Christmas Tree, attend Christmas Eve service, make cookies for loved ones, decorate my parents’ home, attend a Christmas Tree Lighting or two, find a neighborhood with great lights, and on, and on. Do you know what all of these things have in common? Time. Time together as a family. Time is my most precious commodity. I have a limited supply and unlike money, I cannot make more by working harder or working longer hours. If you read any of the same things I read, you cannot go a day without reading an article about how to simplify the holidays, make them more meaningful and less about stuff, all while making swoon-worthy decorations and home-made feasts. “Skip the mall.” “Buy and gift experiences, not things.” “Cut back on your gift-giving.” “Change your own expectations.” These are all laudable, but they also carry with them guilt. Now it is not enough to decorate and bake and attend holiday parties, but the season should also be infused with the right family activities, the right (i.e., more thoughtful) gifts, and be utterly pin-worthy. I am ditching the lists of what I should do because it is what I have always done. I am tossing the lists of what I should do because it is how to make this season more “meaningful and beautiful” (according to whom?). Instead, I am choosing to do the things that bring joy to me and to my family and friends. And whenever I have the choice, I choose time. Time to savor the syrupy sounds from the radio, time to snuggle with my boy in his reindeer jammies, and time to share tea and stories with my loved ones. The end result? When I choose time, I also happen to be choosing those laudable goals of a meaningful, simple, and community-filled holiday. One simple choice will bring you to the same result. 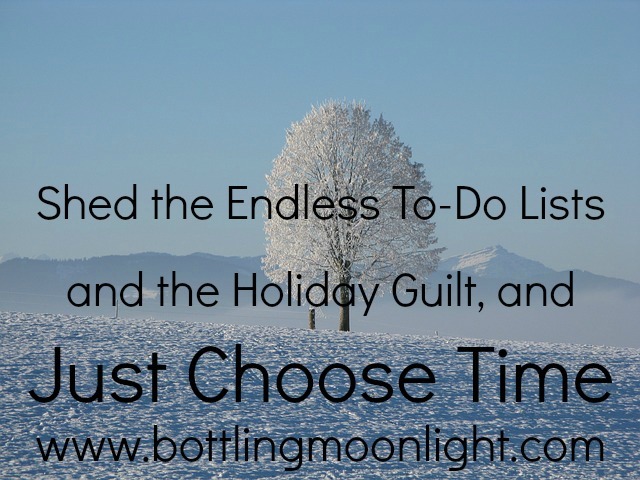 Join with me to shed the endless to-do lists and the holiday guilt, and just choose time. And so we found ourselves in Toys R Us on the Saturday of Thanksgiving weekend. It was the first time I’ve been since I was a child. I remember being so enamored of the store as a young one, thinking that it represented possibility. Possibility of what, you may ask. New toys to unwrap and play with, new people I could become, new worlds to explore on an icy February afternoon, how my life would be more complete with that one perfect, purple, sparkly Barbie skirt. And so it was with a little trepidation that I walked into Toys R Us. My habits of consumerism have taken a nosedive over the past several years, but not without a lot of work and introspection. I wondered if I would walk through the doors and relive the youthful feeling of possibility and excitement I equated with this store, but this time geared towards my child. Before we entered the store, we prepped our son that though we would be going to a toy store, we would not be getting anything for him. We were there to pick out a toy to donate to a local toy drive. I worried he wouldn’t fully understand, but I didn’t give him enough credit. Not once did he ask for a single thing – and we walked up and down most of the aisles. He was content to hug the stuffed animals, briefly pick up a couple of toys to see how they worked, and help us to pick out a toy for another child. We ultimately picked out a scooter – something my husband and I would have gladly received for Christmas as a child. To say I was proud of him was an understatement. Great first trip to a mega-toy store, little guy! But I also feel as if I exorcised some personal demons. I walked through that store and felt nothing but disinterest. Disinterest in what it represented and disinterest in the aisles and aisles of (mostly) junk. This is not to say that I am anti-toy. Van has some superb toys that he plays with regularly, some of which were purchased and some of which were homemade. But, by breaking the tie of objects with possibility, I allow those very real possibilities to dwell elsewhere. The possibilities that I dreamt of as a child are not something to be discarded, but are better if cultivated far from the halls of consumerism. Instead of new toys to unwrap and play with, I find the magic of possibility by making something for myself that I would have otherwise purchased. Instead of thinking about how my life would improve with a new [insert your weakness here], I take an active role and try to improve my life by learning new skills, spending time with people I love and with new friends, and exploring the natural world. In other words, the possibility no longer dwells in a store, but dwells within me. It is up to all of us to tap that potential. And it is up to me to help my son to see the magic of possibility, particularly the kind that does not sit on store shelves waiting to be unwrapped. It is Thanksgiving Day. My favorite holiday of the year. Not only is it a day to eat large quantities of delicious food, it is a day to simply be. A day to enjoy the company of family and friends and to reflect on the many blessings in our lives. Alan, Van, and I have a new-ish ritual of saying one thing we are thankful for before eating dinner. Van’s answer almost always relates to food on his plate in front of him (he’s three, he lives in the moment – though there was the one day he said he was thankful for the library). I so recommend something like this if you are not already doing it. Though it can sometimes feel silly or trite, taking a moment to think of something I am thankful for grounds me. Sometimes I even begin anticipating the evening’s ritual during the day, thereby enriching my day with good thoughts. And so, on this Thanksgiving Day, I would like to thank the many, many friends and family who have provided love, support, and friendship over this past year. My family and friends are the most important part of my life. 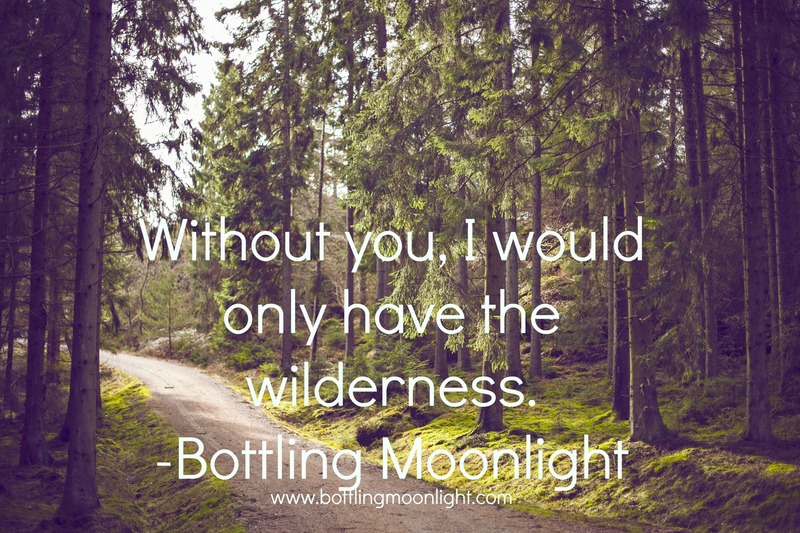 Without you, I would only have the wilderness. As you all know from reading my past posts, this past year has not been without its challenges. There are four individuals in my life who have provided tremendous support and love over this past year who deserve to be thanked publicly. I am honored to be your daughter (Mom and Dad) and your friend (Shannon and Cathy). From the bottom of my heart, thank you for listening, for being there, for loving me, and for providing a real home to the three of us. Or, in the case of my parents, for providing a home for the four of us. We are so lucky that you love Hickory as much as we do. Van is a reader. Cue the applause! I couldn’t be happier about this, even when I’m reading the same book for the seventh time in a day. His latest book on repeat is Harold and the Purple Crayon . Since I’ve been reading it again and again, I’ve been trying to read it with different eyes. Last night, a few parts hit me. Harold, with the moon in tow, goes out on an adventure when “he didn’t seem to be getting anywhere on the long straight path.” He winds up in one-tree forest, in the water, on a boat, on a mountain, and in a hot-air balloon before trying to find his home. He spends a long time looking until he realizes that he was doing it wrong all along. “He remembered where his bedroom window was, when there was a moon. It was always right around the moon.” Upon remembering that he could make his home anywhere, he drew the window for himself and his bed so that he could crawl in and be at home. While there are many clear parallels to my life at the moment (even down to his obsession with the moon), isn’t this true for us all? Very few, if any, of us take the long, straight path. Instead, we alternate between a stride with purpose and a wander that leads us down new paths that we may have missed if we were too focused on the goal. When we planned to leave our lives of comfort and convenience for a journey on four wheels, we had two intentions, to have adventures and to find a new home. What I failed to realize was that the latter goal would have more to do with how I would change over the course of our travels and less to do with the places themselves. Yes, we found places that we loved that surprised us (central Kentucky, anyone? ), and we added places to our list of dream towns (Bozeman, Bend, Crested Butte…), but ultimately, our priorities for a place to call home changed in some significant ways. Proximity to wilderness is still a top priority, but living in the middle of it is no longer something we’d prefer in this season of life. A sense of community is still important, but what that means to us has shifted. I’m less concerned with the specific interests and make-up of a community and more interested in general community traits like kindness, generosity, self-sufficiency, and a lack of self-centeredness. Snow is still at the top of our list, but less because we like snow (we do) and more because I like what snow does to people. It forces us to check any misguided notions that we are the center of the universe. Snow makes us contend with forces greater than ourselves and helps to deflate the ego, even if just a little bit. All this adventure has brought me a lot of introspection. I’m different now than I was two years ago. But as my friend Saskia recently reminded me, home is something that I’ve had with me all along.